We are very excited about Denver’s RiNo (short for River North) Arts District, where even on the most dreary of days we can encounter the kinds of quirky creative surprises that make our hearts happy. If you’re new to RiNo or just want a fun evening immersed in local culture, then the eTuk Drink RiNo Circulator is for you! This is a free ride that circulates around RiNo on First Fridays from 5pm to 10 pm, and also on Saturdays from 2 pm to 10 pm. Befriend your fellow passengers. Get on and off when the mood strikes. Visit artist studios, galleries, restaurants, retail shops, interior design showrooms, and of course, drinking establishments. And what is an eTuk? 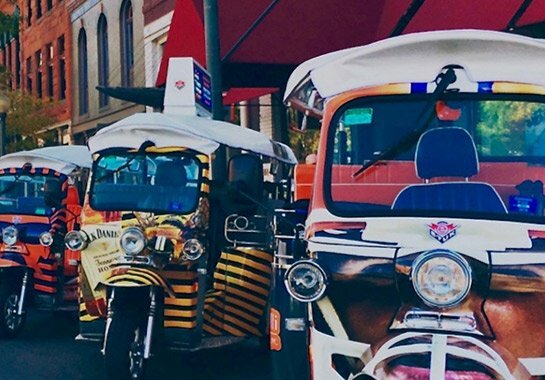 It’s an electric and eco-friendly version of a tuk-tuk, the little three-wheeled taxis that throng the streets of Asia’s cities. One of these Friday or Saturday nights we hope to see you on RiNo’s eTuk, exploring what’s new, what’s exciting, and what’s just plain fun in our growing city.